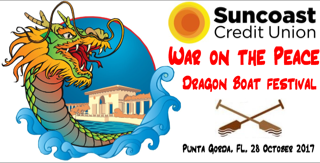 We are now accepting individual paddler registrations for the War on the Peace Dragon Boat Festival October 28th. All paddlers will be grouped together to form a team or will be assigned to teams that have a need for 1 or 2 more paddlers to compete. The individuals will be managed by the City of Punta Gorda (Laishley Park) Harbor Dragos. If the individuals are formed to create a whole team, a group practice will be arranged in advance of the Event, and a steersperson will be provided to train you and keep you "on track"! For questions, please call 813.426.3544 or email jill@highfivedragonboat.com. I, the undersigned, in consideration for receiving permission to use the property and equipment of and/or participate in any event organized and/or run by High Five Dragon Boat, LLC (“High Five”), Punta Gorda Chamber of Commerce and/or the City of Punta Gorda (Laishley Park), and to enter the premises, waterways and grounds supervised or in any way controlled by High Five , Punta Gorda Chamber of Commerce and/or the City of Punta Gorda (Laishley Park) and the receipt of said permission being hereby acknowledged, do hereby forever RELEASE any and all liability, discharge and agree not to sue High Five, Punta Gorda Chamber of Commerce and/or the City of Punta Gorda (Laishley Park) together with their respective agents, members, partners, trustees, representatives, officers, sponsors, licensors, servants, volunteers, or employees, hereinafter known as the releasees. Payment may also be made via PayPal below.